For the past 15 years, Scott Morgan's prolific Loscil project has been quietly compiling a syntax all its own. Rich phrases of luminescent synthesisers linger for minutes at a time, while clipping digital rhythms are occasionally heard gently jutting away in the distance. Scrupulously integrated melodies emerge ghostlike in the mix, barely announcing their presence before melting into the ether. Subtlety lies at the core of Morgan's music, but several albums in, semblances of an overarching narrative have emerged, and the themes are getting clearer. The sheer beauty and occasional melancholy of Loscil's overpowering atmospheres is without question, but the project's own journey has slowly revealed his ability to compose stark landscapes that are evocative, earthly, anything but abstract, and so much more than merely 'ambient'. These aren't instrumental meditations on themes, or abstract visions of places - they're dense and meticulous musical studies, the musical version of a geological survey. From the get-go, Morgan has dealt with very earthly subjects via his icy synthetic textural atmospheres, and over time the methodology has enabled Loscil's shimmering compositions to include collaboration, improvisation, voices and acoustic instrumentation. Having organically assimilated into the Kranky label with 2001's Triple Point, Morgan spent his first five albums on a conceptual upward journey from the microscopic (a 'triple point' is the temperature/pressure at which a substances solid, liquid and gaseous states coexist) up through the ocean, culminating with 2006's Plume foggily heading up into the heavens. Sparse contributions from guest instrumentalists first appeared on 2004's First Narrows, with Josh Lindstrom's vibraphone throughout Plume, propelling Loscil's journey skyward. What came next remains perhaps Loscil's most cohesive and immediately brilliant record: Endless Falls. Less married to a meticulously scientific conceptual focus, and less concerned with having glitchy beats centrestage, Endless Falls was when Loscil found his true soul, and - as suggested by the title track with its field recordings of Vancouver rain - came crashing back down to once more wander the Earth. Subtly integrated field recordings became more prevalent on Coast/Range/Arc's beatless dabs of colour - an album inspired by the mountains of the Pacific Northwest - and once again on the beguiling melancholy of Sketches from New Brighton, which integrated recordings made in Vancouver's coastal New Brighton Park. If Sketches From New Brighton was Loscil once again dipping his toes back in the ocean waters from whence he came, then Sea Island sees Morgan clambering into the nearest trawler and setting sail back out into the open sea. From album to album, Loscil's sonic palette has broadened and shifted at the same melting glacier speed as his music, and Sea Island marks another indirect shift, somewhat combining the more colourful and glitchier elements of the guest-heavy Sketches From New Brighton with the composer's most directly rhythmic experimentation since Plume. Lying ahull is when a ship caught in a storm simply downs all its sails, and allows the weather to wash over it - and Morgan's decision to name the striking opener as 'Ahull' is an apt one. We're forced to weather the storm as a pulsating set of distorted synthesiser chords clash polyrhythmically as they phase quickly from left to right, washing over us in waves as Lindstrom's trusty vibraphone comes in with a simple arpeggio. It's a simple, powerful phasing exercise akin to the early Reich compositions (and I don't use that over-cited name lightly). A wash of bass tones and gradual diminuendo close the piece, as the storm passes overhead, our vessel having managed to remain intact. Stereo phasing features heavily elsewhere too - a menacing set of tones shift percussively left and right atop the powerful chord progression and pinging water droplets of 'In Threes', while synthetic blasts of gentle static akin to a drummer's brushwork craft a hypnotically phasing rhythm either side of 'Sturgeon Bank'. 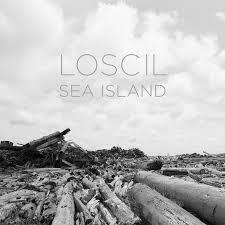 While Loscil's base materials remain largely unchanged, his full engagement with the stereo field on Sea Island helps to flesh out its distinctly nautical sound. It's a method he's touched upon before - notably on his next most oceanic work, First Narrows - and on headphones it's a pretty powerful way of invoking the aural setting of the sea as we're yanked from side to side like the tilt of a boat in choppy waters. Discernible field recordings further flesh out the seascape, with 'Iona' making heavy use of watery washes of grey noise, like the crashing of heavy rain on waves out to sea. Besides the aforementioned vibraphone, Loscil has several collaborators into Sea Island. Regular Loscil guest Jason Zumpano melds note-perfect Rhodes tinklings with tunes like 'Holding Pattern', while Seattle pianist Kelly Wyse (with whom Loscil released a full-length collaboration last year) punctuates the closing stanza of the blurred gothic narrative of 'Sea Island Murders' and takes the lead for the very Noto/Sakamoto-like stasis of 'En Masse'. 'Bleeding Ink' is possibly the biggest surprise, as Loscil amounts amasses scattered blips into a chord progression before Vancouverite singer Ashley Pitre wordlessly begins to sing. Like all of Loscil's best work, how it feels to hear Sea Island is largely down to the listener. The odd discernible field recording, and carefully selected track titles gives us a slight nudge in the right direction, but atmospheres of this ilk make for rewarding listening whether it's active or passive. The passive listener will find 11 slices of instant utter serenity on Sea Island, while a deeper listen reveals a starkly depicted, and often dramatic ocean voyage, haunted by memories from back on dry land. Scott Morgan mastered his method several years ago now, allowing his focus to switch to the subject matter, and Sea Island is all the better for it. It's a brilliant piece of work in its own right and continues to see Morgan peerless and at the very top of his game. Sea Island is a fitting addition to Loscil's increasingly impressive body of work; the uninitiated are advised to dive in headfirst.